Super Mario Bros. is one of the most influential games ever released in the history of video games. It was first published on the Famicom in Japan, and on the Nintendo Entertainment System around the world. It was the number one selling Famicom game released in 1985, selling approximately 6,810,000 copies in its lifetime, over four times as many as the next best selling game, Soccer. It was one of two games that were largely credited with reviving the depressed video game market in the United States, which had plummeted around 1983. The other game credited was The Legend of Zelda, and both games were the creation of world recognized game designer, Shigeru Miyamoto. 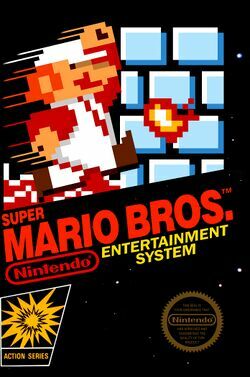 While Super Mario Bros. is a sequel to the original Mario Bros. game, it is the first game in the celebrated Super Mario series. Although it was not the first side-scrolling platform game (Namco's Pac-Land preceded Super Mario Bros. by one year), it was by far the most popular, and arguably influenced the genre's success for many following years to come. Before it gained popularity in the United States, Nintendo released a special version of the game in to the arcades called Vs. Super Mario Bros., which contains mostly modified levels, as well as a few new ones. The game has been reproduced on the SNES with enhanced 16-bit graphics as part of Super Mario All-Stars, on the Game Boy Color as Super Mario Bros. Deluxe, and on the Game Boy Advance as part of the Classic NES series of titles. It is also available on the Wii Virtual Console and the 3DS Virtual Console. In a land far beyond human imagination, lies a magical place called the Mushroom Kingdom. The Mushroom Kingdom is always sunny, and food is plentiful year round. The Kingdom was ruled by a gentle and peace-loving Mushroom King and his daughter, Princess Toadstool (who would later come to be known as Princess Peach.) The Mushroom people were living peacefully, and all was bliss. Then one dark day a tribe of evil turtles named "Koopa" led by the tyrannical King Bowser invaded the tranquil Kingdom. There was a terrible war. The Mushroom people fought courageously but they were no match for the vicious turtles. They were easily defeated by the Turtle Tribe, and horrible Bowser's black magic turned all the Mushroom people into stones, bricks and even horsehair plants. Princess Toadstool, the only one with the power to free the Kingdom from the evil power of Bowser, was captured and exiled to a deep dungeon in a faraway castle. Mario, a man of courage and determination, heard of the awful fate of the Mushroom people. He decided to save the fair Princess and free the citizens of the Mushroom Kingdom from the evil control of Bowser. This is where the legend ends, and the adventure begins. The fate of the beautiful princess and the Mushroom people is now in your hands! This page was last edited on 25 July 2017, at 20:38. This page has been accessed 146,586 times.